A. 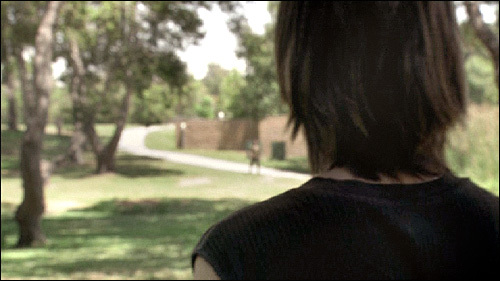 In Episode 7 (of Season 1) - "Circle of Friends". 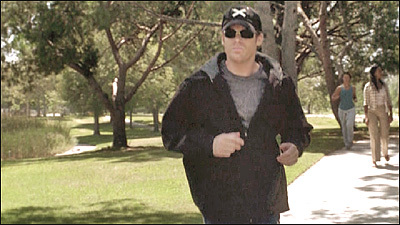 We see Dexter jogging in the park, wearing a hooded parka and dark sunglasses, looking rather sinister, as he stalks a young serial killer named Jeremy. 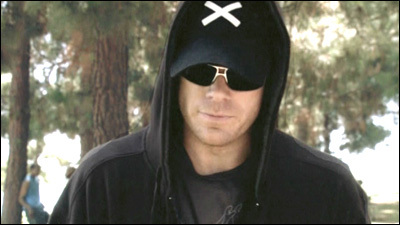 In an earlier episode, Dexter was about to kill Jeremy (after discovering him stalking a young victim), but changed his mind when the teenager told him that the man he killed earlier had raped him. Later, though, Dexter finds that Jeremy had subsequently slaughtered an innocent student, and decides he made a mistake letting Jeremy live. He learns that the kid is working Flamingo Park as a gay hustler, so he goes out jogging there in disguise, to remedy his mistake. 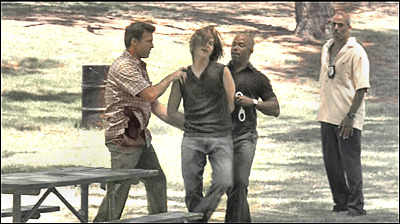 He is about to pick up Jeremy (and kill him), when suddenly the cops swarm in and arrest the boy for murder (as a surprised Dexter retreats). A. A public park with a lake - but not in Miami. A. 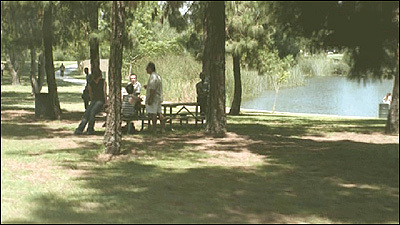 This scene was shot at El Dorado Regional Park, at 7550 E. Spring Street, in Long Beach, CA. But El Dorado is a huge park (800 acres and several lakes), so that address is somewhat misleading. To be more specific, it was shot at the large lake just north of Wardlow Road. The jogging path they used is on the west/northwest side of the lake. Unfortunately, that particular lake is not easy to reach. Although there's a perfectly good entrance on Wardlow, right next to the "Dexter" lake, that entrance is permanently closed. Instead, they make you go all the way to Spring Street (the next major street to the south), and use the entrance on the north side of Spring Street. If that's not enough, they also charge you $5 just to get in (is it just me, or is there something vaguely un-American about a public park charging the public money to visit?). And then, once inside the park, you have to navigate a maze of park roads, past other lakes, then through an underpass that goes below Wardlow Road, before finally emerging on the north side of Wardlow. After you emerge from that underpass, make a right and head east, and you'll soon end up back at the same closed entrance on Wardlow, only this time, you'll be inside the gate. Turn left and head north a short distance and you'll find the parking lot on the west side of the lake. 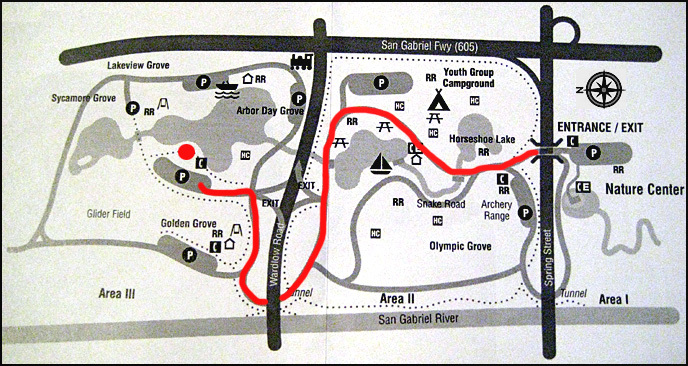 To make it easier for you to find the lake, if you want to visit the park, I've included a map with the driving route inside the park marked in red. Click here to see it. Here is an aerial photo of the park. And here is a map link. A. This one took forever. And I eventually found it only because a fan tipped me. 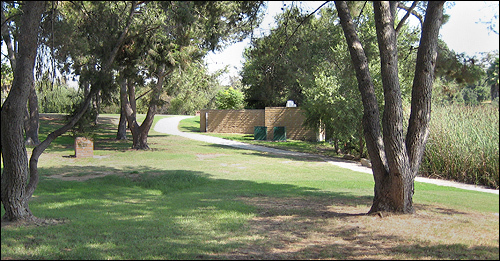 From the start, I was almost certain that it wasn't an actual Florida park because of the presence of a large number of Canary Island pine trees. Canary Island pines are ubiquitous in L.A., but aren't common in Miami. Also, it was a scene from Episode 7, and they seem to have stopped most filming in Miami after Episode 5. At first, I was pretty sure it was Harbor Regional Park in Wilmington (which strongly resembles the actual location). But then, upon closer examination of the scene, I spotted what appeared to be a small brick building in the park, and there was no such structure to be found at Harbor Park. I spent a long time hunting through other parks, without finding anything close. Eventually, I phoned the L.A. park department and asked if the "Dexter" crew had filmed at Harbor Park, and I was told that they hadn't. 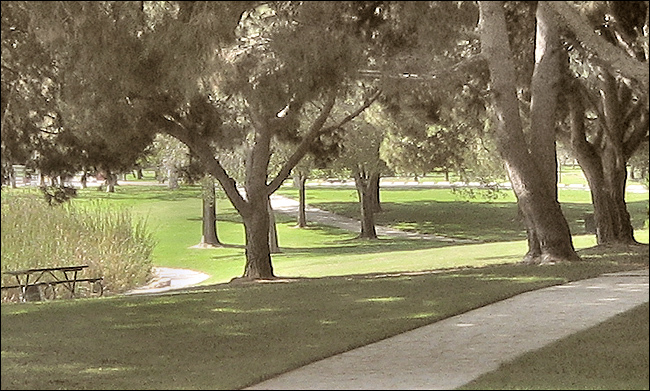 In fact, they told me "Dexter" hadn't filmed at any L.A. park. So, since I was in the middle of creating these pages, and had already wasted a lot of time not finding "Flamingo Park", I moved on to finishing other pages. I got a few other suggestions, but none of them panned out. Finally, in 2008, Kelly Toepke (who lives in El Dorado Park Estates in Long Beach), emailed me to ask if I had eliminated El Dorado Park as a possibility. I could have kicked myself. Somehow, I had overlooked El Dorado, a huge park on the northeast side of Long Beach. Not only is it located in Long Beach (the center of "Dexter" country), but it also contains several lakes, and I've been there. It should have been one of the first places I looked. My only excuse is that I had never visited the lake area of the park. I've been to the park's nature center, to its south side lawns and to its duck pond, but never to its larger lakes. So when I saw it onscreen, I didn't recognize it. Plus, when the L.A. parks department told me that no local park had been used, I failed to consider that Long Beach parks wouldn't be included. So, I immediately looked at the park via Live Local aerial photos, to see if it matched up. I eliminated the lakes one by one, until I came to the big lake just north of Wardlow. Taking a closer look at that area, I was amazed to see all of the elements from that "Flamingo Park" scene fall into place: the Canary Island pine trees, the jogging path, the swampy reeds at the water's edge... And as the pièce de résistance, I spotted what I thought might be a small brick outbuilding near the northwest corner of the lake. But to be certain, I had to go there in person, to see if I could match up the scenes with reality.